The Bad Mouse app for iPhone and iPad from Jiguin is like whack a mole, but with a little more love put into it. It’s also a good way to introduce whack a mole into a younglings life. With more kids running around with iPads and less in arcades, these games are slowly dying in younger generations. At first impression, I only picked up Bad Mouse because it felt tasteful. Compared to some other apps I have played in the past, Bad Mouse looked more like there was actual effort put into it and wasn’t something for a quick paycheck. Don’t get me wrong, I’m not saying that my past reviews were half assed but there are a lot in the App Store that just isn’t worth the download let alone the money. I was recently in china, and even kids over there are running around with iPads and tablets. What really made me giddy was this one child at the airport playing blaster tank. I was like, “HEY I REVIEWED THAT.” Everyone looked at me not understanding a word…. Anyways, my point being that remaking these old simple arcade games is an awesome way to introduce old school into the new. More games that are simple like Bad Mouse should be made, not for us the older kids but for the babies soon to come. Alright now let’s start to do some reviewing. Bad mouse had some ups and downs, and as I type this out I continue to think of more things they should change and keep. Let’s start with the good and get to the bad shall we? Firstly the color is wonderfully done. With so many different types of enemies (moles, damn those moles) it’s awesome seeing so much color put into them. It’s simple yet comfortable to the eyes. And the different items you can use are wonderfully creative too. Game play is well; Whack a mole. I mean all you do is smack them moles. How hard can it be right? Well, it’s quit difficult if you don’t have patience. Bad mouse does take a little speed and accuracy early on, which I thought would really stand in the way of a kid much younger than I. Of course the shop really helps. It requires clovers that you collect from smacking the moles. In the shop you can buy various items like, mallet upgrades, mallets that are strong against x type of monsters. I mean moles, GOD I HATE THEM MOLES. The only negative I have against this game is it’s sometimes so specific with the items you HAVE to use. And I stress have. It’s not a game that you can just beat without upgrades or items. You have to get that next item no matter how fast your; ahem taps per second, are. Besides that, there is really nothing else to hate from it. Item upgrades is the “thing” to make a game more complex nowadays. Bad Mouse is refreshing but it follows the trend of most simplistic iPod apps at the same time. There is really nothing different from other apps that I saw from this game compared to the next, meaning Bad Mouse can easily be cloned as a genre if tried. At the end Bad Mouse is just another “poke the screen” type. Although I do have to say this is a great “one shot” for a quick $1.99 in the app store. And of course there is a free version which is a must now for anything costing over a buck. 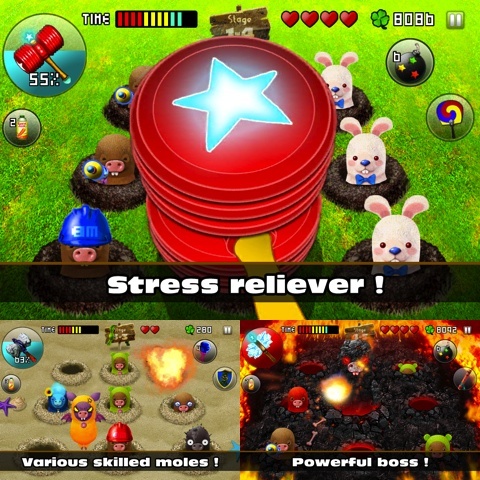 AppSafari review of Bad Mouse was written by Vincent Tam on February 8th, 2012 and categorized under App Store, Arcade, Beat-em Up, Games, iPad apps, Resource Management, Universal. Page viewed 5975 times, 1 so far today. Need help on using these apps? Please read the Help Page. A fun game to play with .. I really liked it and love to play anytime.